Get Certified, Get Known – Enroll on Conformiq training platform! To make testing in an agile process successful, organizations should focus on two important testing operations, i.e. 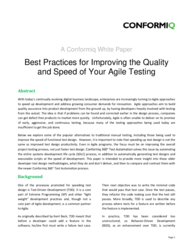 organize the testing process for repeatability and speed of change and design the tests well for known coverage. Conformiq Creator is designed to organize, design, document, and optimize your tests and do all this at speed. With its focus on test design quality, Conformiq 360° Test Automation helps the project teams with faster, up to speed test design with higher productivity than manual test authoring. It enables testers and software developers to complement the work done by business analysts, system engineers, and customers by generating the necessary tests as both Gherkin scenarios and test automation scripts of the entire test logic including test data. 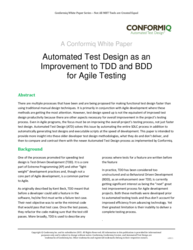 Learn how Automated Test Design embraces next-gen testing approaches and delivers the needed quality and documentation for projects at the speed of development. Contact sales@conformiq.com to learn how to test at the speed of development. Conformiq 360° Test Automation promotes continuous testing and helps you master your short testing cycles through its automated test design approach. The solution automates the design (actually the thinking of) the test cases, optimizes them, and then generates full coverage reports, executable test scripts with validations. The software integrates with all other tools in the SDLC tool chain including RQM and ALM tools, various drawing tools, Excel test cases, and automated execution platforms both commercial and customized. The key is Conformiq has eliminated the manual test steps between tools and for test and validation design. This is the only way companies will achieve the continuity and speed required core continuous testing. Our next-generation solution enables testers and software developers to complement the work done by business analysts and system engineers by generating the tests they created as both Gherkin scenarios and test automation scripts for the entire test logic. With automatic test generation, systematic and repeatable coverage of the functionality can easily be tested. The model can be quickly changed with any requirement changes, updating test automation codes automatically. This also eliminates the issue of maintenance. 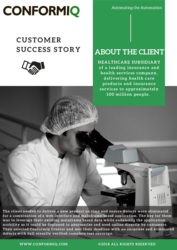 For more information, connect with our experts @ sales@conformiq.com and effectively deliver your continuous testing objectives. 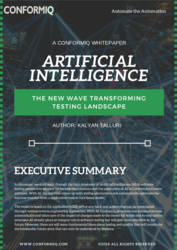 Artificial Intelligence (AI) is becoming an important aspect of software testing today with even greater promise in the future. With more and more focus on automation and agile, adoption of newer technology will become a requirement. AI’s machine learning is typically centred on training software tools to understand input versus output today (similar to typing an input into a field and learning from experience what the expected output should be). With CITA (Conformiq Intelligent Test Automation), Conformiq users can customize, extend, and maintain generation of automation script actions by teaching CITA via Excel (no programming required). This supervised learning of CITA helps non-automation engineers like manual testers and even developers to accelerate test automation. CITA is user trained to normalize inputs by removing the “noise” and identifying the automation data and objects automatically. Using NLP CITA then optimizes initial inputs before transforming tests to automation. It works with any input format, any target technologies, and any test automation framework! Learn how Conformiq is leveraging the latest technology automatically generate test automation code for execution. Contact sales@conformiq.com to learn how to leverage the CITA capabilities in your environment. 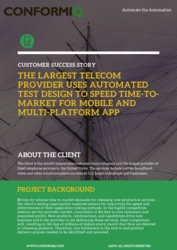 Mobile testing seldom stands alone because testing for proper operation across multiple platform technologies leverages test execution needs hard to get from one vendor. This is where Conformiq Creator makes omni-channel testing, including mobile testing, viable. By modeling the application’s logic, Creator then automatically generates test cases for full and documented coverage. From these test cases, Conformiq then uniquely goes the next step to automatically generate test scriptrs with validations for execution across any platforms. Thus, the mobile testing can occur on Appium, Selendroid, or any other platform while testing for equivalent functionality on non-mobile devices using the same or easily modified test cases can be run on Cucumber, LeanFT, or another platform. The key to success is multi-platform integrations and the ability to graphically change the application logic to reflect each unique hardware capability and automatically generate tests for all of them with a single click. Learn how Creator enables mobile and omni-channel testing using its built-in library blocks for user interface actions. Contact sales@conformiq.com to learn how mobile testing can be simplified by automating the thinking of the test cases needed for all platforms. There are a variety of ways you might want to test mainframe applications. You might test the back- office application with data accessed from a SQL database or using a 3270 terminal emulator or testing together with a GUI interface on a PC. Conformiq Creator enables testing for all these scenarios. Data in an external database can be called from the generated test scripts, terminal text strings can be modeled, and mainframe modeling blocks can be imported as custom actions and interfaced to user interface actions on another platform. To execute these various tests, the generated test scripts can be exported to different test platforms unless one platform like Micro Focus UFT can handle all aspects and the execution harness is configured to handle all of it. If not, these tests can be separated and tested individually. Remember that Creator tests the functionality of the SUT, so it doesn’t matter what language the application under test is written with such as COBOL. Contact sales@conformiq.com to understand the extent of the capability delivered by Conformiq Creator for mainframe testing. Testing inter-application interfaces requires a different design and modeling approach from user interface testing. The objects are different and the complexity of all API traffic and payload combinations can be huge. This means thorough testing of APIs needs design automation to both generate and optimize the test cases quickly enough to not have QA become the product release bottleneck. This means that a test design tool must have the capability and flexibility to functionally test the variety of operations needed across an enterprise. Beyond just the test cases, scripts, and validations that are generated by Conformiq Creator, it is critical the testers and the project stakeholders know what has been tested by what and have known full traceability through the process so automatically generated documented is required too. Contact sales@conformiq.com to understand how API testing can be added to other types of functional testing with one test design tool – Conformiq Creator. You can now create executable automated tests directly from your manual tests through Conformiq’s new test automation product M2A (Manual to Automation). 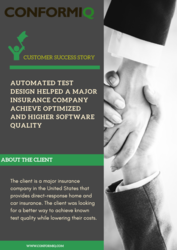 M2A delivers a solution to the testing process for those companies who want to continue to write tests manually yet want to quickly automate their execution without writing scripts. M2A is designed to work with any test format, application technology, and test automation framework. Our M2A approach is powered by CITA (Conformiq Intelligent Test Automation) Natural Language Processing AI techniques. M2A’s CITA concept works on the philosophy, ‘The more CITA is trained - the less it needs to learn!’ Once the manual tests are uploaded, CITA automatically normalizes the manual tests. This is followed by analysis and optimization of test cases with generation of automation reports. Users can also “teach” or update CITA mappings via Excel for a specific target technology and test automation framework. Once this is done M2A can directly convert manual tests directly to automated execution. Easy as 1, 2, 3 – here’s how it works!